Filter/Cafetiere: Tangerine upfront with cocoa nib and hints of cherry through the body and a lovely buttery cocoa aftertaste. Espresso: Tangerine initially with a Cocoa and Cherry Body and a lovely buttery cocoa aftertaste. Brew ratio 1:16. 18 grams of coffee to 350 millilitres of water. Temp of Water 93 degrees. Brew for 3 - 5 minutes. Aroma Notes: Tangerine & Cocoa. Tasting Notes: Tangerine upfront with cocoa nib and hints of cherry through the body and a lovely buttery cocoa aftertaste. Tactile Note: Well balanced with a mild acidity with an amazing sweetness and a lasting aftertaste. Works well all day, best served black with no sugar or milk. Brew ratio 1:2. 16 grams of coffee to 32 millilitres of water. Temp of Water 92 degrees. Full Medium to Full Medium Roast colour spectrometer profile 114. Aroma Notes: Cocoa & Cherry. Tasting Notes: Tangerine initially with a Cocoa and Cherry Body and a lovely buttery cocoa aftertaste. Tactile Notes: Mild acidity with a medium body and creamy mouthfeel. Enjoy all day as an Espresso or Flat White to really enjoy the flavours of this truly special coffee! In the south of Ecuador, on an idyllic plateau surrounded by the mighty Andes Mountains lies the small village of Vilcabamba. From Quechua, the language of the Inca, the name translates as “Holy Valley”. This place is especially blessed; – nowhere else in the western world are more people who grow as old as this, and enjoy the best of health at the same time. Generations of scientists and doctors have tried to solve the secret of longevity in Vilcabamba. Some thought that the water from the rivers Vilcabamba and Chamba had a medicinal influence, whilst other considered the stable and mild climate with temperatures between 18 and 22 degrees responsible. Located at around 1500 meters above sea level, the incredibly good air is supposedly cleaned by a mystical plant named “Hilo”. This plant provides a possible explanation for the extraordinary strength of the people. A clear explanation however has never been found. The only certain thing is that in this tranquil and serene location visitors from all over the world come to rest, forget their daily stresses, and allow themselves to be infected by the harmony and joy of the people of Vilcabamba. The cultivation of coffee has a long tradition for the people of Vilcabamba. On the mountain slopes of this magical place, the small farmers of Vilcabamba grow the very best Arabica coffees. For them this drink is a small luxury. During the harvest, between June and October, the families pick the ripe red cherries and clean the beans in the water of the nearby Mountain Rivers. Then the coffee is slowly sun dried and hand sorted. Thus a coffee of extraordinary quality is created. Only small quantities of this coffee are produced each year as it is cultivated primarily through manual labour and family businesses. 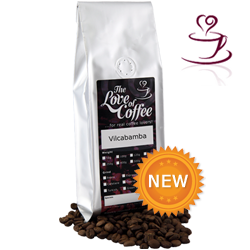 Freshly roasted and prepared, the Vilcabamba impresses the connoisseur firstly with its fresh, slightly fruity tones and again with a long lasting soft but yet intense coffee aroma.